Sneak Peek: The Fry Station! This week we’re going to walk you through The Fry Station in Papa’s Wingeria To Go! When you first get to The Fry Station, you’ll notice six fryers that you can use. 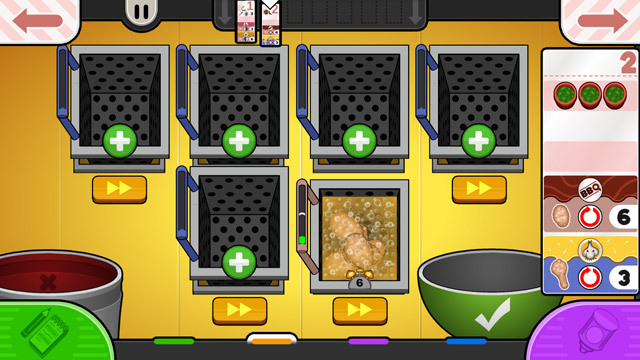 To get started on your order, just click on the “+” button above an empty fryer. 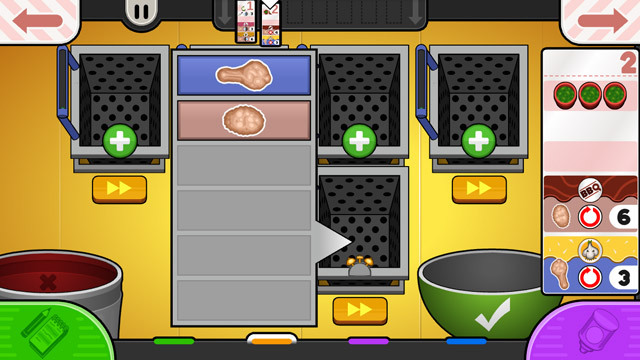 You’ll then get a popup menu to help choose the meat that you want to fry. For this example, we will select the boneless wings. After you choose the proper meat, a second popup menu will appear. Here you can choose the amount of meat that you want to cook. In this case, we will be frying up six boneless wings. Once you have chosen the right amount, a meat bin will slide in and pour the correct amount of meat into the fryer. Once they are fully cooked, simply drag the fryer basket over the green bowl to send your fried food to the Sauce Station! Stay tuned for more sneak peeks of Papa’s Wingeria To Go!